Drexel is a comprehensive global research university ranked among the top 100 in the nation. With approximately 25,000 students, Drexel is one of America’s 15 largest private universities. Leadership in experiential learning through Drexel Co-op. A history of academic technology firsts. Recognition as a model of best practices in translational, use-inspired research. Three Philadelphia campuses and other regional sites. The Academy of Natural Sciences of Drexel University, the nation’s oldest major natural science museum and research organization. International research partnerships including China and Israel. Drexel Online, one of the oldest and most successful providers of online degree programs. Drexel is one of Philadelphia’s top 10 employers, and a major engine for economic development in the region. Drexel has committed to being the nation’s most civically engaged university, with community partnerships integrated into every aspect of service and academics. Drexel’s ongoing strategic plan, “Transforming the Modern Urban University,” guides the University’s 21st-century trajectory. 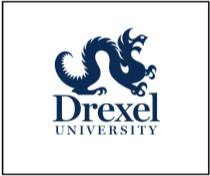 We thank Drexel University for their ongoing support.